Albicosus is a large, ringed, terrestrial planet in the Caperion System. It is the fourth planet from the star, Caperion. The world is cold and harsh world with a small colony. Albicosus is a cold and mostly barren world. It is the fourth planet in the Caperion system, at a distance of 460 million kilometers from the star, Caperion, and has an average surface temperature of -10 Celsius. With a diameter of 26,616 kilometers, it is the largest terrestrial planet in the system and has a high gravity of 2.05 times standard. It orbits Caperion every 586 standard days, and has a planetary rotation time of 93 hours. 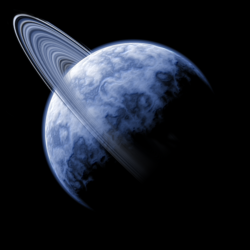 It is the only ringed planet in the system, with a ring comprised primarily of rock and ice. An atmosphere is present, but has an incredibly low oxygen level. Albicosus has a single moon, Ulress. Albicosus and its moon, Ulress, share a long history. Albicosus was initially settled by the families of those who began mining out the moon. As Ulress hollowed out, those families built a massive complex city within the moon itself leaving behind a perfectly usable colony on Albicosus’ surface. Once the mining ended however, the citizens of Ulress turned the moon into a den of scum and villainy. This page was last modified on 11 June 2017, at 16:56.